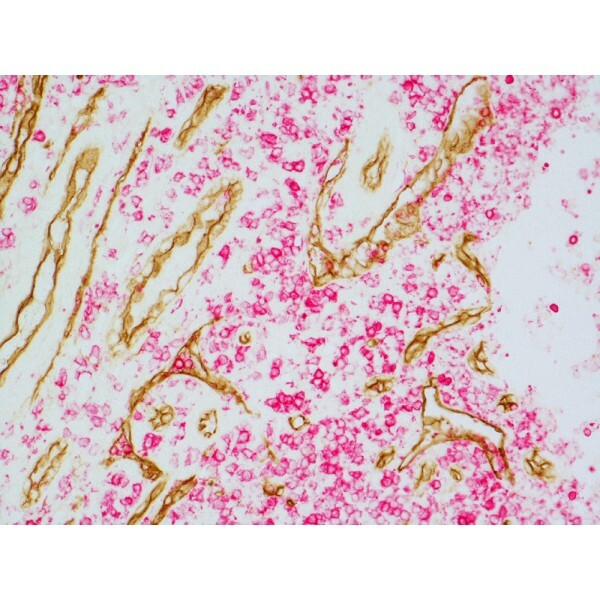 The ImmPRESS™ Duet Double-Staining Polymer Kit for immunohistochemistry delivers the same advantages of polymer stains including low background stain­ing, high signal intensity and the elimination of off- target binding. The kit enables fast, well-defined localization and visualization of two different target antigens on the same tissue section. ImmPRESS Duet combines highly active horseradish peroxidase (HRP) and alkaline phosphatase (AP) enzyme polymers, conjugated to anti-mouse IgG and anti-rabbit IgG secondary antibodies to produce a ready-to-use HRP/AP formulation.